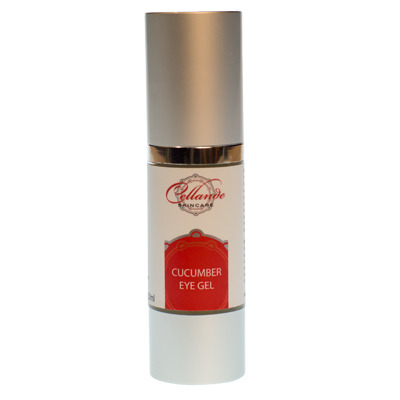 Cucumber Eye Gel - A fusion of Aloe Vera, Cucumber Oil and Marine Collagen to sooth and moisturise, the antioxidant powers of Green Tea, the vitamin and mineral rich Seabuckthorn Oil known for its anti-ageing effects and the toning abilities of Witch Hazel, will have you saying 'eye want more'. Purified Water, Natural Vitamin E, Cucumber Oil, Seabuckthorn Oil, Siberian Ginseng, Aloe Vera Leaf Juice Powder, Marine Collagen, Witch Hazel Extract, Green Tea Extract, Phenoxyethanol, Ethylhexylglycerin, Disodium, EDTA, Sodium Hydroxide. A preparation recommended to use as is around the delicate area of the eye to help prevent premature signs of aging and dryness.